February 8, 2018: It might not be too often that you walk into a brewery that's only been open just over a month and expect things to be running like it's been around a while. 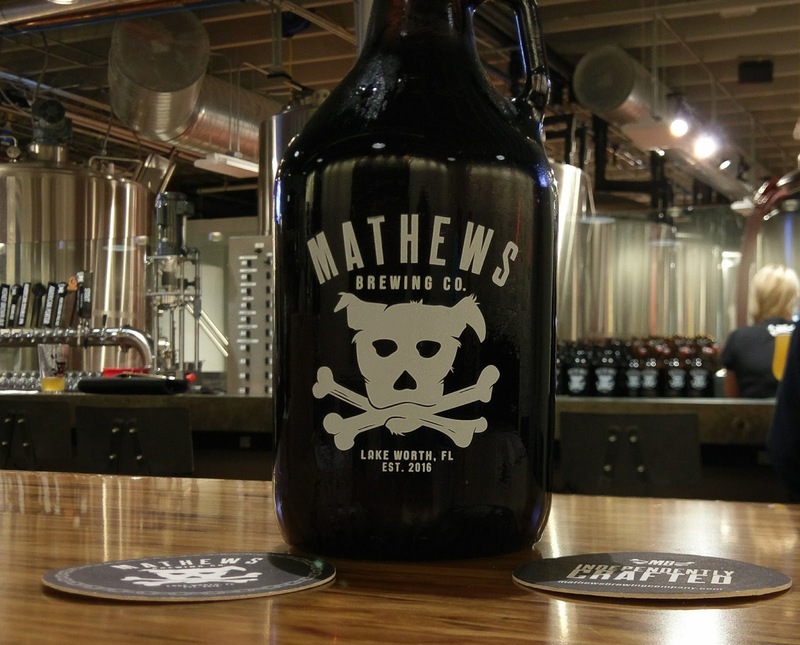 No bones about it: Mathews Brewing Company, Lake Worth, is already up and running like a big dog. Maybe it's the engineering and homebrewing background of Owner Dave Mathews (not the band and concert guy, but we'll get to that). 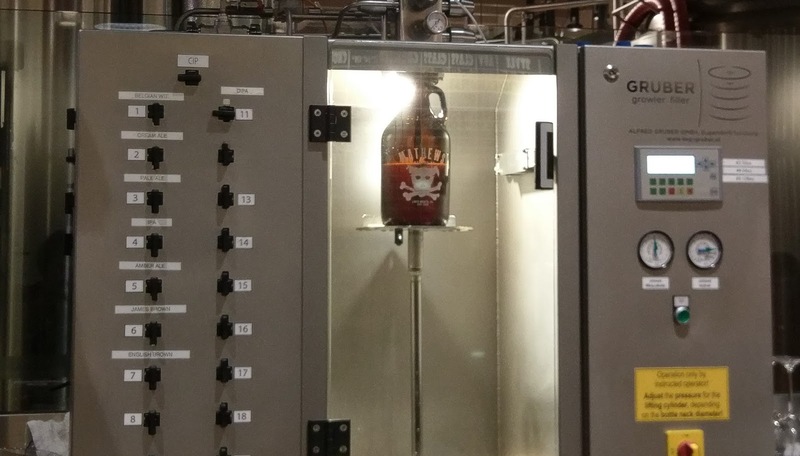 Maybe it's the commercial brewing experience of Head Brewer James Retzler. The ingredients all add up to a recipe that's pretty doggone good from the tap room to the outdoor patio... to the beer. First, you have to get there. If you're not familiar with Lake Worth, a quick search on your favorite online map shows the location about a half mile west of I-95 near US 1. 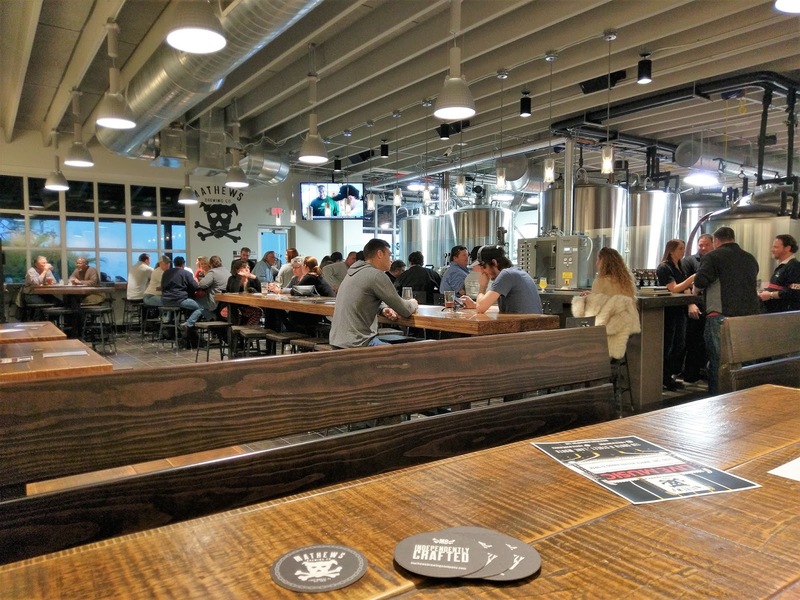 The brewery is situated in an older mixed industrial/commercial/residential area that might not look like a home for a sparkling new brewery. The building itself, which formerly housed the Lake Worth Herald, stands out, with its crisp white exterior and gray trim. Just look for the dog-and-crossbones. 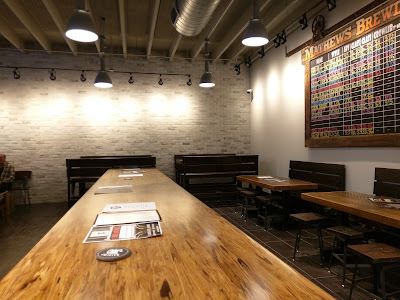 Inside is a spacious tap room, a blend of industrial and woodsy, with an open loft ceiling, wood tables and metal-and-wood bar stools. A large menu board on one wall lists the beer and cask ales on tap (yes, you read that right: cask ales are a regular thing here). 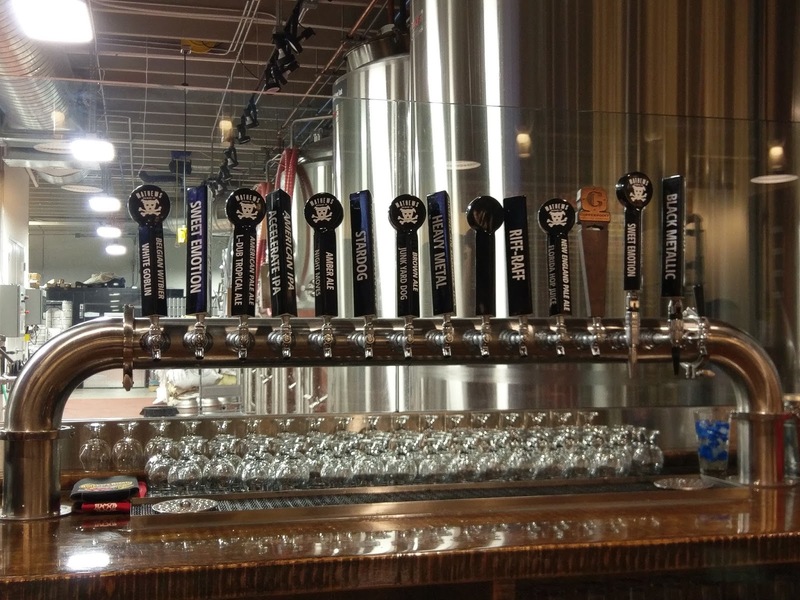 The zinc-topped bar features a view of the 10-barrel brewhouse beyond the tap handles. The interior is very inviting. 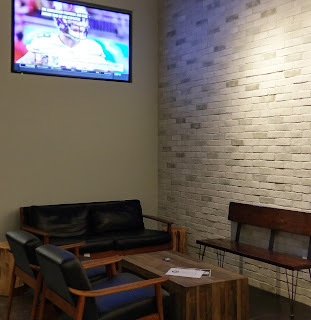 A corner lounge area with a TV borders an aesthetically appealing brick wall lined with track lighting. Sure looks like a great place to sit and have a few beers, right? The answer is Yes. 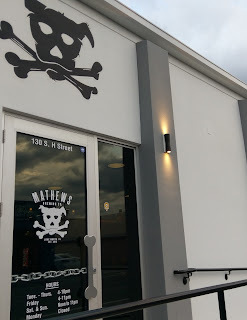 From a patron's perspective, Mathews Brewing doesn't seem to be going through new brewery "growing pains." 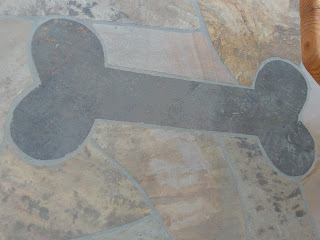 All the way around, it's very polished for a new brewery, and if you didn't know it, you would think it's been here for a while. 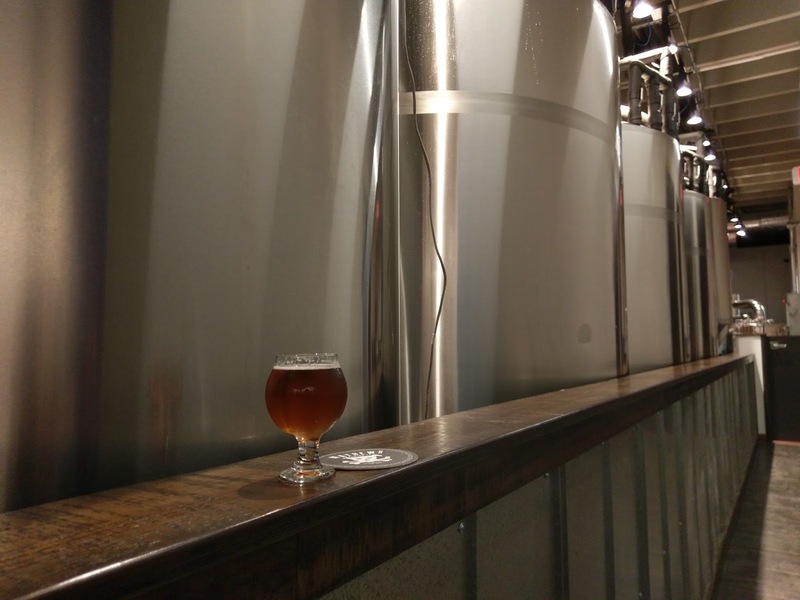 However, the brewery only opened on December 15, and it threw one shindig of a party for its Grand Opening on January 13. With around 12 house beers, plus two to four house Cask Ales from the beer engines, on tap at any given time, there's a constant variety of beer styles here. Of course, no better way to delve into those than by ordering short pours and making up your own flight. Overall, the beers are solid and on point. 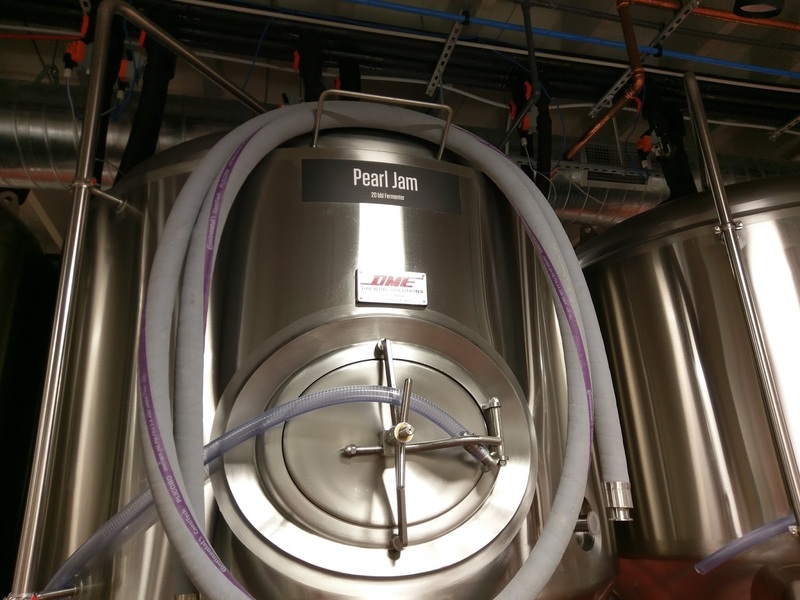 With James' former background as a commercial brewer with Due South Brewing and Big Blue Brewing (and there were some awards in there, too), this shouldn't come as a surprise. 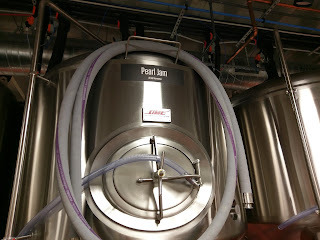 In addition, Owner Dave has around 15 years of homebrewing experience. One of the more unusual (in a good way) Cream Ales is the Sweet Emotion Cream Ale (4.7 ABV/20 IBU). A lighter beer in terms of ABV and IBU, it features noticeable vanilla for an added character and flavor, with a touch of sweetness. The Night Moves Amber is a malty red with caramel notes, which has a full mouthfeel. Almost porter-ish is the Star Dog Brown, with a highly roasty character not found in many brown ales. Yes, there's a "New England" style: the Florida Hop Juice Pale Ale stays the course with its hazy appearance and fruity and tropical aromas and flavors, with a bitterness on the finish. There were more beers on tap on the day of this visit, including Session Pale Ale, Belgian Wit, English Brown Ale, and an Irish Dry Stout. The tap room also offers a water cooler, and it's advisable to replenish and re-hyrdrate! 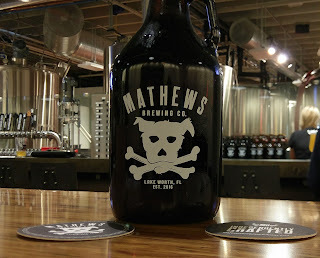 And, that's when the Heavy Metal Double IPA made an appearance in the lineup. At 8.4 ABV/94 IBU, this citrusy and hoppy DIPA packs a punch, while being smooth and highly drinkable at the same time. If you're looking for something a wee bit different, try one of the English Cask Ales. 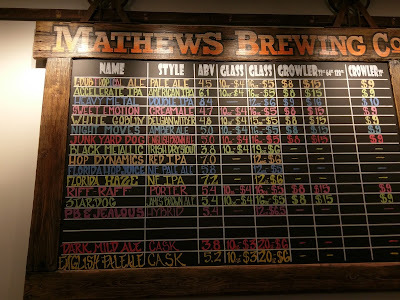 Not something seen on a regular basis too often, the beer engines at Mathews Brewing are actually from England and pour beers true to the English style, at around 50°. The bar typically features at least two Cask Ales. 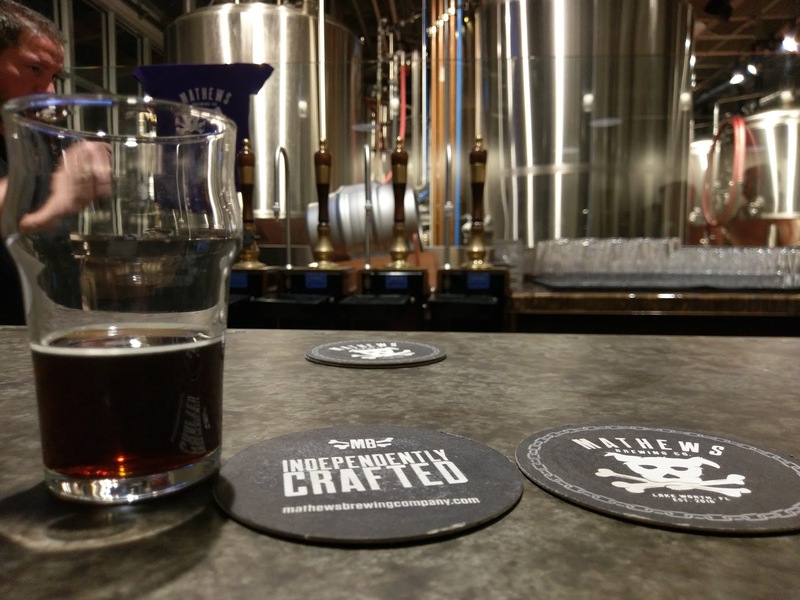 English Dark Mild Cask Ale (3.8 ABV), with beer engines. 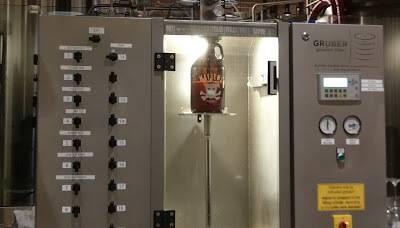 A maltier version of a Mild Ale. Note the clarity. There's definitely some "heavy metal" here. 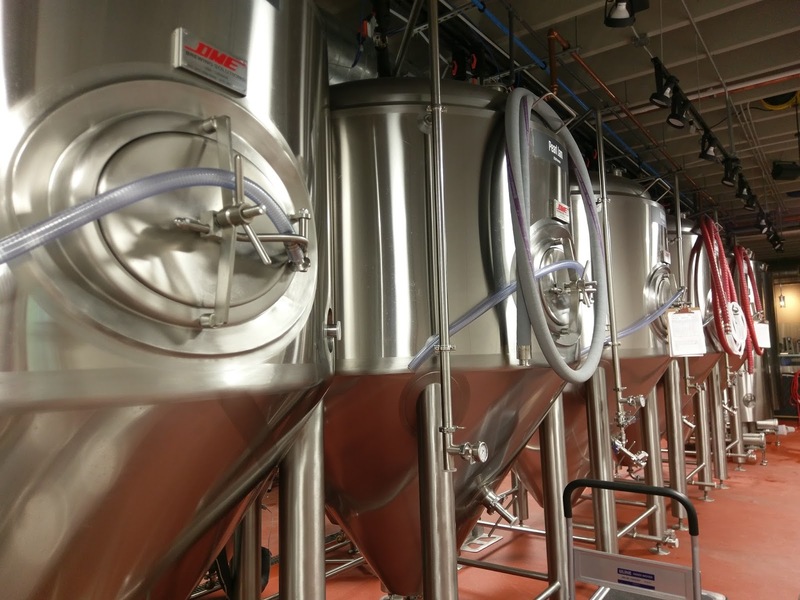 The brewhouse is designed to brew heavy quantities of beer, with six fermenters: five 20-barrel and one 10-barrel, and four brite tanks: three 20-barrel and one 10-barrel. Add in two two-barrel pilot systems. It all adds up to a lot of beer. 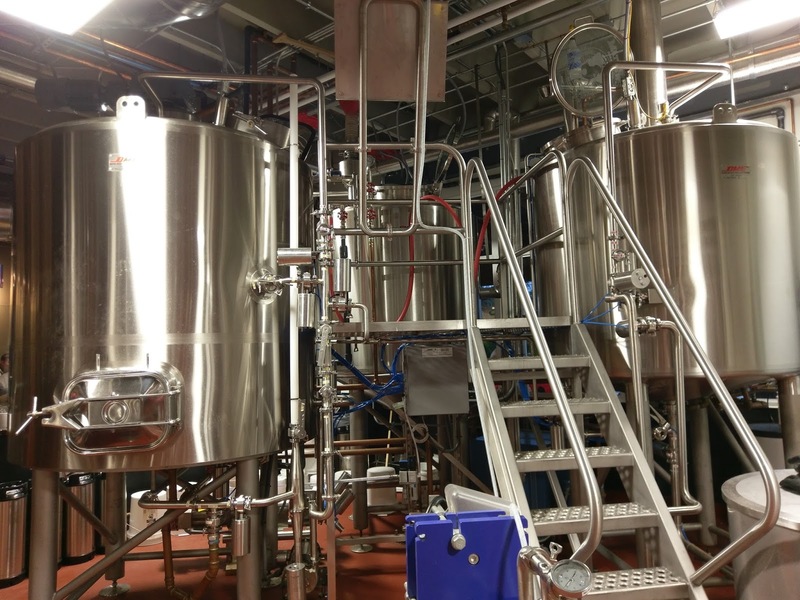 The brewhouse is also equipped with a reverse-osmosis water system and a grain mill. All of the beers are brite-tank conditioned, said James. All of the above might have you howling for a beer right about now, but you haven't seen the outside yet. Yes, there's an outdoor beer garden with a covered patio, too. 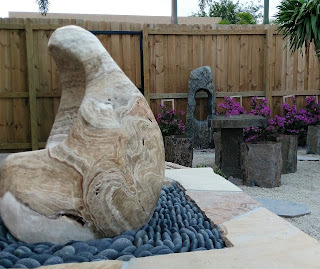 Dave purchased the adjacent land for the purpose of building a beer garden. Not a typical beer garden, either, this one features rock gardens, all designed by Dave. The dog theme is a tribute to Dave's dog, a Jack Russell terrier, who used to be a homebrewing partner. 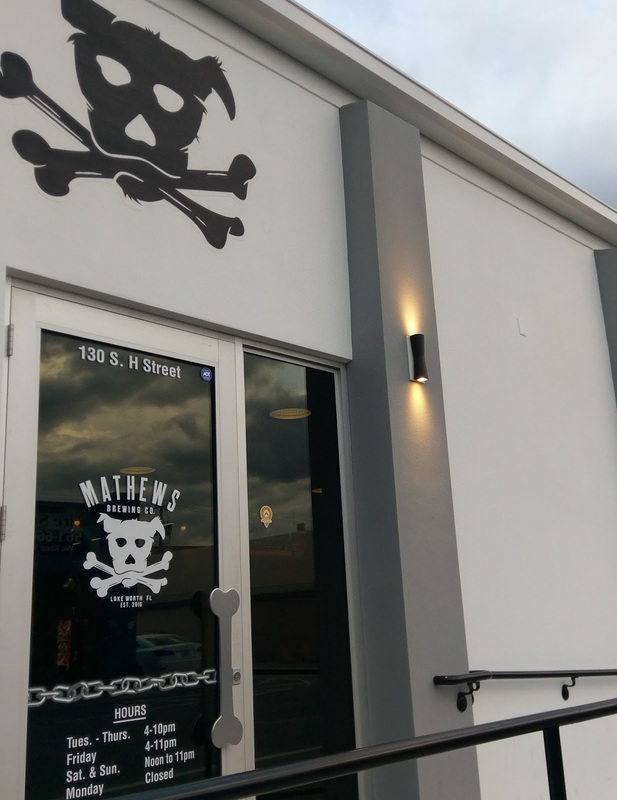 With Dave's upbringing in Tampa, the pirate concept was combined with the dog, and the dog-and-crossbones was born. 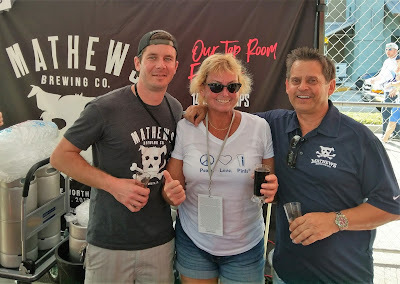 This visit came in mid-January after the Grand Opening, and I again caught up with Dave and James a week later on a return trip to South Florida at Jupiter Craft Beer Fest. With James (l) and Dave (r). That was my second stop at the tent. My first beer of the fest was the Mathews Brewing Cream Ale (below). 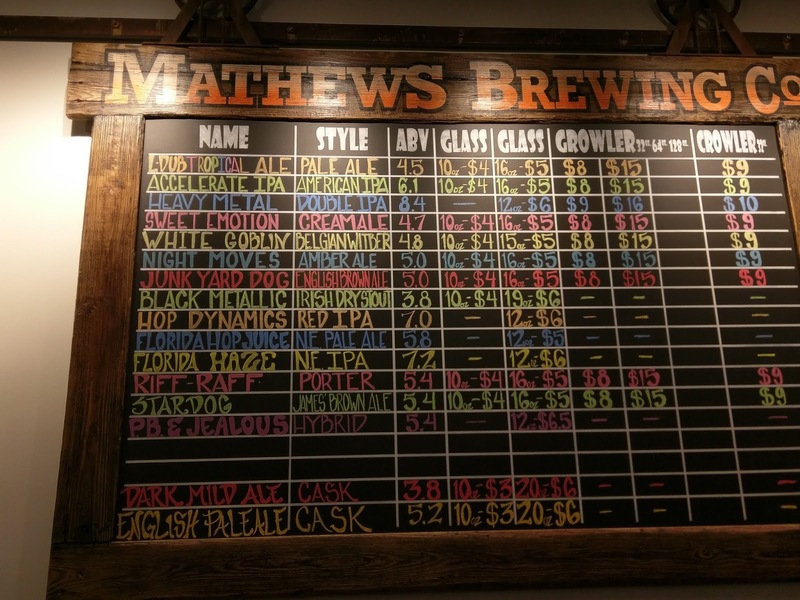 You'll definitely be barking up the right tree with a visit to Mathews Brewing! 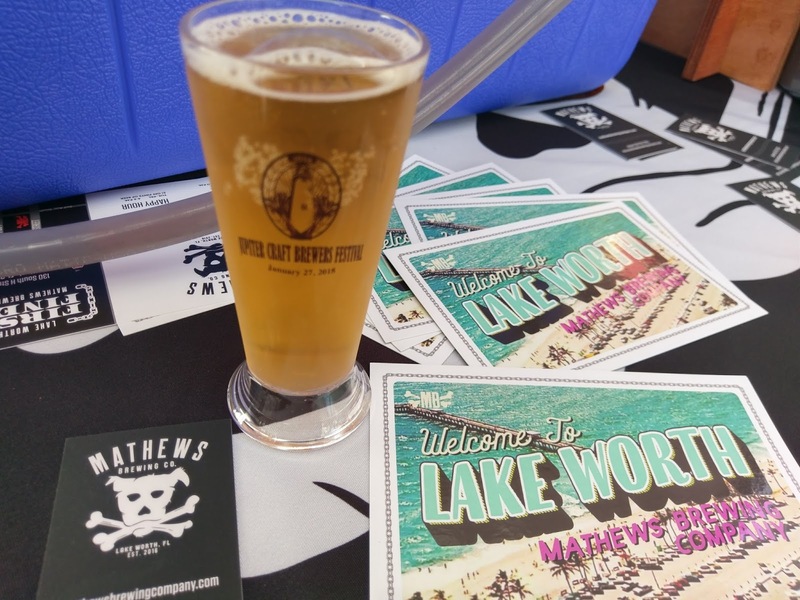 Mathews Brewing is located at 130 South H Street in Lake Worth, just south of West Palm Beach. Valet parking is available at the front entrance, along with a reasonably-sized parking lot within the same block. Otherwise, on-street parking may be found around the block, although it might require a drive around a time or two. The street is generally lined with industrial-type businesses, making curbside same-street parking limited. 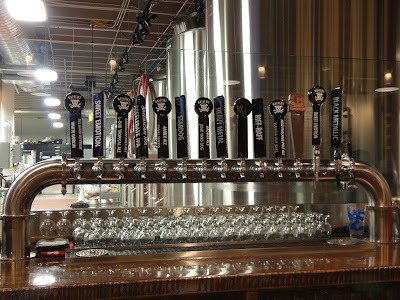 The tap room is open six days a week, Tues-Thurs: 4-10pm; Friday: 4-11pm; Saturday-Sunday 12-1pm; closed on Mondays. 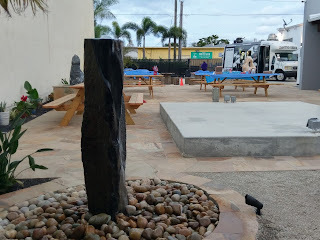 Live music and food trucks are regularly scheduled. 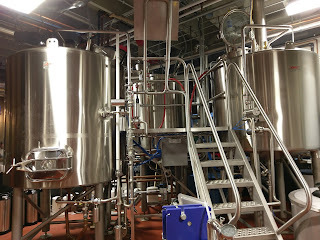 Thanks to Dave and James for showing me around the brewery! It doesn't seem like the place has only been open since December. Congrats to Dave! 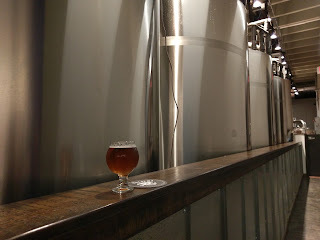 It's a very cool place, with solid beer, and, I'd like to add, a very friendly staff! 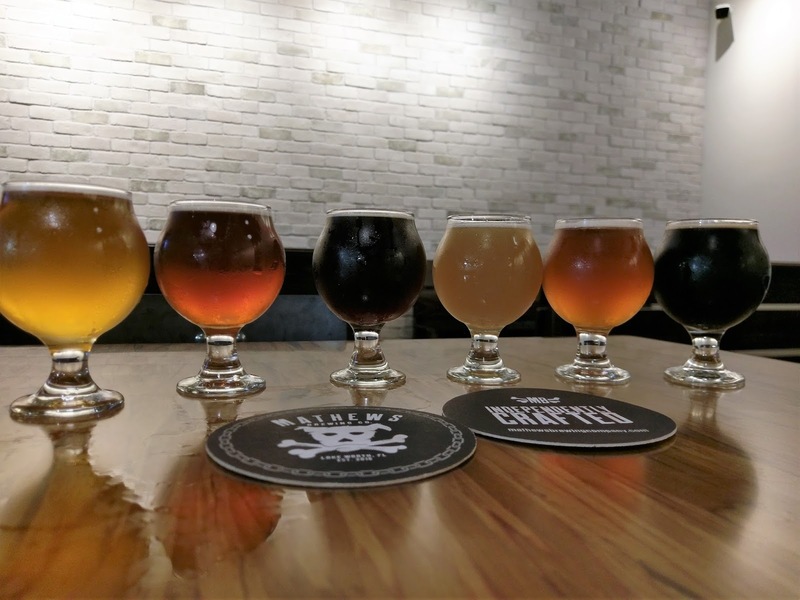 If you're doing a beertrip to South Florida, add this one on your list. Hey! 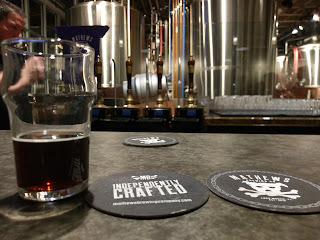 Be sure to take a look at the events calendars on brewnymph.com, for your next beerfest and beertrip. I might even see you there!